The Camper's Edge Folding Knife/Saw Combo is ideal for all outdoor situations. The Camper's Edge is designed with a high-carbon stainless steel knife blade and a saw blade that makes short work of branches. Blades lock in the open and closed position for safety. 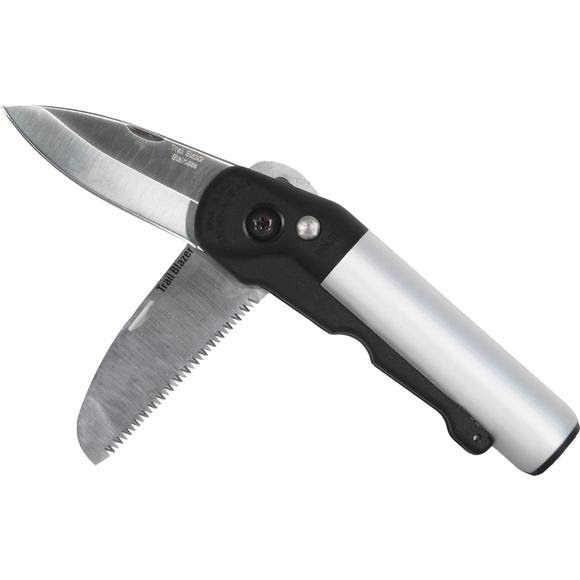 The Camper&apos;s Edge Folding Knife/Saw Combo is ideal for all outdoor situations. The Camper&apos;s Edge is designed with a high-carbon stainless steel knife blade and a saw blade that makes short work of branches. Blades lock in the open and closed position for safety. Tri-edge Saw tooth design rapidly cuts through PVC, Rubber, Wood, Plastic, and even Dry Wall!